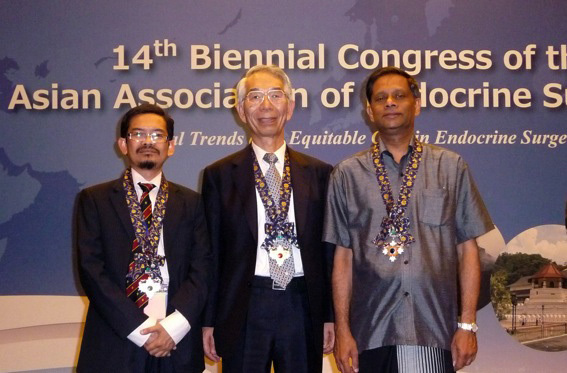 Congress President Professor Ranil Fernando (picture above) held the 14th Biennial Congress of the Asian Association of Endocrine Surgeons from March 13th to 15th at Jetwing Blue Hotel in Negombo, Sri Lanka. He and the Local Organizing Committee worked very hard for running the Congress showing warm hospitality. 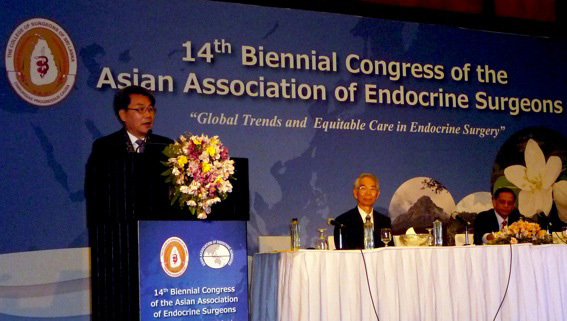 The theme of the Congress was “Global Trends and Equitable Care in Endocrine Surgery”. The scientific program included 10 plenary lectures, 8 symposiums, and free paper sessions. Four of the plenaries were presented by really distinguished doctors from outside the area of our Association, including Prof. Geoffrey Thompson who gave Norman Thompson Lecture, Prof. Janice Pasieka, Prof. Mark Cohen, and Prof. Quan Yang Duh. The remaining six plenaries were presented by delegates of our Association, including Congress President Fernando and Chairman Miyauchi myself. The topics of the plenaries and symposiums covered all area of endocrine surgery, thyroid, parathyroid, endocrine pancreas, and adrenal gland. 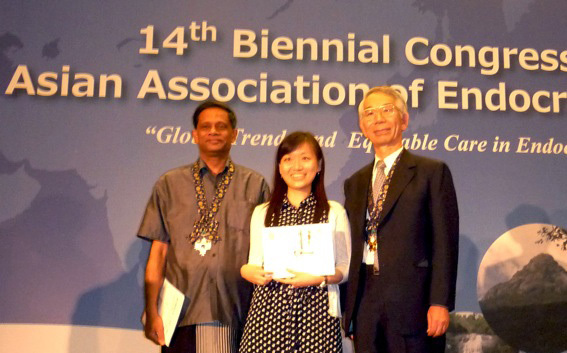 These were really scientific and educational and accorded with the theme of the Congress. One of the free paper sessions was for candidates for Fujimoto Prize. Eight referees evaluated their presentations and selected 3 winners. The First Prize winner was Dr. Shirley Yuk-Wah Liu from Hong Kong, China (picture above), the Second was Dr. Yukiko Tsushima from Nagoya, Japan, and the Third was Dr. Bup-Woo Kim from Seoul, Korea. I am sure that the Congress was very successful and all of the attendants were satisfied with the program and the very warm hospitality of Sri Lanka people. This Congress was the first Congress held under the Constitution of the Association, which was made and approved at the 13th Congress in Singapore. Secretary Treasurer Professor Rohaizak explained about the membership and membership fee that was included in the registration fee. At the Council Meeting Professor Euy-Young Soh at Ajou University, Korea (picture above), was elected as Congress President-elect who became Congress President for 2016 on the next day of the last day of the 14th Congress. At the closing ceremony, the flag of the Association and the medal for Congress President was handed over from Professor Fernando to Professor Soh. The 15th Congress is going to be held in Korea in 2016. I am looking forward to seeing all of you with many of your colleagues there.